To cap a week when the religion news was dominated by the Mormon Church again tarring gays as immoral, while other ministers openly defy federal tax laws and dare the government to respond, it is fitting that we can observe today the 130th anniversary of the accession to the Mormon presidency of that most defiant of God experts, John Taylor. John Taylor was born in England in 1808. He began his God expert career as a Methodist, but converted to Mormonism in 1836. Taylor rose rapidly in the Church hierarchy, joining its “Twelve Apostles” after only two years. When the Mormons were driven from Missouri after losing a miniature civil war there, he decamped with the rest for Nauvoo, Illinois. There he edited the Nauvoo Neighbor, commenting approvingly on a Mormon technique of dealing with dissidents: smearing them with excrement taken from outhouses. He also inadvertently set in motion the chain of events which led to the death of Mormonism’s founder Joseph Smith, when he proselytized and brought to Nauvoo a Canadian named William Law. The first issue of the Expositor was also its last. Mormon thugs, on the order of the hierarchy, invaded its office and smashed the presses. That was the last straw for the Illinois authorities, whose patience was being sorely tested by Smith’s campaign to treat Nauvoo as his personal kingdom. Smith, his brother, and a couple of other top Mormons – including John Taylor – were arrested and jailed in Carthage, Illinois. From jail, Smith summoned his 4,000-man personal army to come and break him free. But before that could happen an angry crowd broke in and murdered Smith and his brother, who had a long history of evading justice, severely wounding Taylor in the process. We are indebted to Taylor, though, for his published reminiscences of himself and Smith guzzling smuggled wine in the Carthage jail until they felt “dull and languid,” contrary to the abstinence they preached to the rest of Mormondom. In the confusion, Taylor wound up not being tried for his role in the Expositor case. He returned to Nauvoo, where he helped the Church make money – quite literally – as part of a counterfeiting ring. When federal agents descended on Nauvoo seeking his arrest, he fled to England, and later joined Brigham Young in attempting to establish an independent Mormon kingdom in Utah. Utah was brought to heel by a federal army the following year. One might think that a foreign-born criminal like Taylor with such un-American views would not have been allowed to participate in the territorial government, but he was appointed a judge, then elected speaker of the legislature, and then superintendent of Utah public schools. One can only imagine the kind of brainwashing that went on in the schools during Taylor’s regime. Nevertheless, the hottest issue in Utah at the time was not the schools but polygamy, a federal crime. Taylor spoke out forcefully against it: “We are accused here of polygamy, and actions the most indelicate, obscene, and disgusting … These things are too outrageous to admit of belief,” while quoting from early Mormon scriptures condemning the practice. At the time he spoke, he had 12 wives. That was the Mormon way: brazen lying to shield utter contempt for the law. Meanwhile, Taylor spent his time trying to change the subject to the ignorance of his Christian persecutors, who did not know nearly as much about God as he did. 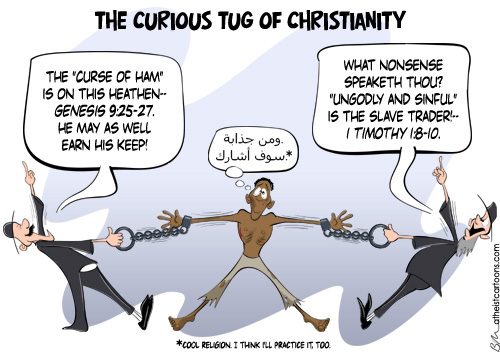 “[A]re Christians ignorant? Yes, as ignorant of things of God as the brute beast … the devil could not invent a better engine to spread his work than the Christianity of the 19th century. … What does the Christian world know about God? Nothing.” He also set up “Zion’s Central Board of Trade”: a racket of Church-owned businesses whose success was assured by a pulpit-enforced boycott of non-Mormon competitors, blazing the trail for the immense corporate and real estate wealth owned by the Mormon Church today. By the time Brigham Young died in 1877, Taylor was head of the “Twelve Apostles” who ran the church, which was now more open about polygamy. “We are not ashamed,” he proclaimed, “to declare that we are polygamists … that we are firm, conscientious believers in polygamy, and that it is part and parcel of our religious creed.” Internal bickering kept the presidential post vacated by Young open for three years, but ultimately on October 10, 1880, John Taylor was elected the third president of church, following in Smith’s and Young’s footsteps. He took office at a difficult time: the Supreme Court had just ruled that polygamy was not protected by the First Amendment, national feeling was strongly in favor of “doing something” about Utah, and the opening of the transcontinental railroad made the doing of something about Utah far more practical than it had been in the 1850s. Hundreds of federal polygamy prosecutions followed, especially targeting the Church leaders, who were the ones who could afford to keep the most wives in the first place. 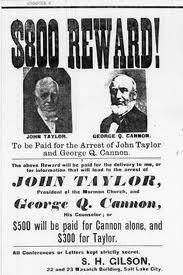 Taylor threatened another war: “They who fight against Zion shall be destroyed; and the pit which has been digged shall be filled by those who digged it.” But Utah wasn’t Nauvoo, and when his army failed to materialize, President Taylor ignominiously dropped into hiding. Taylor was comforted in his hideout by two events. First, a friendly visit from God himself, who gave him a revelation to stand fast on polygamy forever: “I have not revoked this law nor will I, for it is everlasting & those who will enter into my glory must obey the conditions thereof.” Then, putting God’s advice into practice, 78-year old Taylor took on yet another wife, 26-year old Josephine Roueche. Frustrated at its inability to find Taylor, the federal government passed the Edmunds-Tucker Act, disincorporating the Mormon church as a criminal enterprise and forfeiting most of its vast landholdings. Taylor responded aggressively, with a string of shady deals to transfer Church land titles to accomplices before the government could get its hands on them. 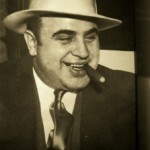 He also set up a colony in Mexico for fugitives from justice, where Mitt Romney’s father was born. Taylor died of a heart attack in 1887; I guess Josephine was too much for him. By 1933, the kinder and gentler Mormon Church was officially denying that the 1886 revelation to John Taylor had ever happened. Today, in official Church histories, Taylor is listed as never having any wives at all. 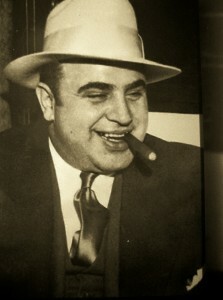 Instead, he is described as a “Champion of Liberty.” If John Taylor was a “Champion of Liberty,” then so was Al Capone.